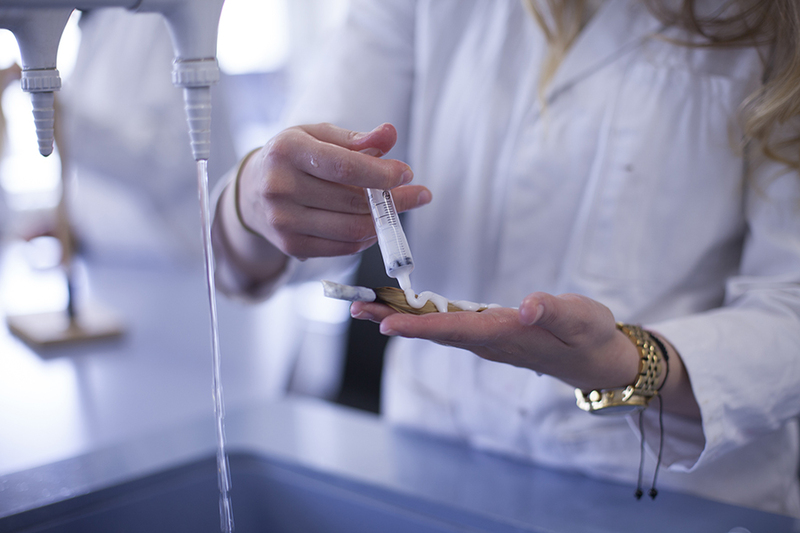 Caroline Searing is a lecturer for MSc Cosmetic Science, where she teaches Human Biology. In this interview she talks about how she went from working for the Ministry of Defence to lecturing at LCF, the importance of keeping the public correctly informed about ingredients used in cosmetic products and the benefits for students of taking a placement year. Caroline never expected to become a lecturer, even less teaching for a cosmetics course at a fashion college: "I never liked the whole idea of being at the front and doing the talking," she says. She started her career at the Ministry of Defence as a respiratory physiologist, and even though this experience could seem far from the cosmetic field, the fact that she had to learn a lot about skin, hair and nails gave her a solid understanding on how our body reacts under different environmental conditions. After that first experience, a few changes in her career led her to a new, unpredicted chapter in her professional life: "I never expected to end up in a fashion school. Because of my background, sometimes I feel a bit like a fish out of water. But one thing that I really like from this college is that it's never boring, a lot is going on here all the time." "...one thing that I really like from this college is that it's never boring, a lot is going on here all the time." More than a decade has now passed since Caroline started at LCF. She has grown fond of the challenging art of lecturing, advancing her teaching techniques to make her sessions more interactive with the students: "It's much better if I invite students to participate and ask questions if something doesn't make sense for them. I hope they think of my session as a non-threatening environment where there is no such thing as a stupid question." She acknowledges the topics covered in class are often quite hard for students, so part of her job is assisting those who struggle to grasp the fascinating area of human biology: "When someone has been struggling with a concept and they finally say "I get it! ", that's when I get the most satisfaction, when I've helped someone to overcome the difficulty of the subject." "There are a lot of people who are misinforming a public which is desperate for information but that doesn't always go to the right places to get it." On top of her classes, Caroline dedicates time to expanding her current research topic, focused on the role of makeup in the creation of identity and how it changes in older women: "I've been interviewing ladies in their 60s to see how their timeline of makeup usage has changed, from their teenage years, through working and motherhood, and now in retirement. It's been very interesting to see how much influence their mother has had. Contrary to the idea that women look at celebrities for makeup inspiration, we have found that the biggest role in influencing makeup usage in young girls is taken by mothers." For prospective students, Caroline encourages them to explore the many different doors that the MSc can open for them: "This course is unique in the country. MSc Cosmetic Science provides you with a solid grounding in the industry and a taste of all aspects of it, from the biology (which is my bit) to the different forms of cosmetics, marketing, legislation, distribution, management..." Moreover, Caroline emphasises that the placement year can help students to kickstart their own professional path: "It helps you to find the role that you like and it allows you to understand and see the wealth of opportunities within the industry. We're very, very proud of our employment statistics, and every year we receive the same feedback. The companies are so pleased with our students that they want to keep them right after their placement year finishes, so even before graduating they already have a job waiting for them."